1. 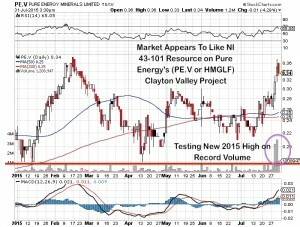 I recently highlighted Pure Energy Minerals (PE.V or HMGLF) who just announced an NI 43-101 Inferred Resource on Clayton Valley of 816,000 Lithium Carbonate Equivalent. Lithium is the one bright area of the resource space as the price has been rising and on Tesla (TSLA) building a gigafactory in Nevada. 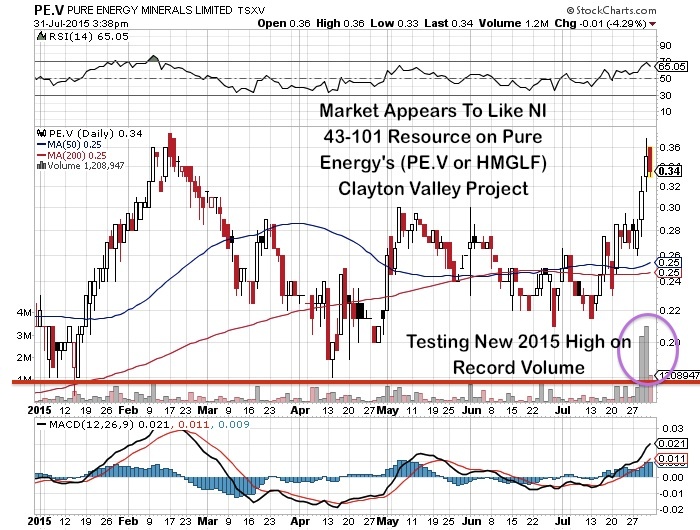 Pure Energy has 8000 acres around the only producing lithium mine in North America. Its a brine deposit which is the lowest cost type of lithium to process and its only three hour drive from the gigafactory. 2. I am a shareholder of Fission (FCUUF) and believe the merger with Denison (DNN) could benefit the entire Athabasca Basin. M&A is the name of the game in uranium. Notice the recent merger with Energy Fuels (UUUU) and Uranerz and the proposed merger of Fission with Denison and another merger of Uranium Resources (URRE) and Anatolia. The combined larger entities could attract strategic/institutional investors which could open the capital markets to improved exploration and development budgets. In this bear market companies need to consolidate in order to cut costs and attract major institutional interest. Now Denison with Fission will have the best portfolio of high grade advanced uranium assets in the Basin plus free cash flow from Denison’s toll milling agreements and management fees with Uranium Participation Corp (URPTF). Fission shareholder’s will have a major U.S. listing on the NYSE MKT with Denison and a better chance of attracting more funds who have market cap and listing requirements. Despite all this merger chatter, Fission is hitting and growing PLS by leaps and bounds with just outstanding results. Also keep a close eye on Fission 3 (FISOF) and Canex (CSC.V) who have just begun drilling at Clearwater which is adjacent to PLS and is by far one of the most prospective targets of Fission 3′s immense portfolio in the Basin. This is high risk but the gains can be huge as we witnessed with discoveries in the Basin in the past. Fission’s famous award winning geologist Ross McElroy believes Clearwater may be one of the most prospective targets in Fission 3′s portfolio. 3. Pershing Gold (PGLC) recently rolled back its shares and uplisted to the Nasdaq. Quite often after such moves some of the penny stock players sell their shares. It appears there was a high volume reversal just a few days ago. It may be coming off the bottom. It has one of the most advanced mining projects with a permitted mill in Pershing County Nevada next to some of the big boys such as Coeur (CDE). They have been hitting amazing high grades and the CEO is former Franco Nevada. He has made major deals with the largest mining companies in the world in the past. Disclosure: I own Pure Energy, Fission, Fission 3, Canex, Uranium Resources and Pershing Gold. Pure Energy, Fission 3, Canex,, Uranium Resources and Pershing Gold are all website sponsors.